My brother Matt and I recently visited the island of Guadeloupe in the French West Indies part of the Caribbean. Like many of you, I've enjoyed watching Zenith STOL float flying videos on YouTube: There are dozens of great video clips from Greek islands, the Alaskan back country, and Caribbean beaches. The (relatively) small main island of Guadeloupe has two flight schools using Zeniths as trainers and we decided to visit them both. (See the bottom of this post for video clips). Here we arrive at the Orizon seaplane base, located right next to a resort hotel in Gosier, Guadeloupe (a few miles from the international airport). Since Guadeloupe is part of France, the aircraft are registered as ULM (or microlights) and are also operated under French ULM / microlight rules. Here I meet with Danièle and Albert to talk airplanes (in French). It was nice to be hanging around airplanes while barefoot and surrounded by warm tropical water. We looked at the floats and the planes. Since Zenair re-entered the float building business last year, my brother Matt (who heads Zenair in Canada) wanted to see first hand how the Zenair floats have been holding up in salt-water training environment (two very rough conditions on floats and airframes!)... The new Zenair floats improve upon the older float models in several significant areas. Despite constant exposure in the salt water environment the airframe and floats have held up very well, especially the 6061-T6 aluminum parts. (Unprotected steel parts corrode in no time at all, as Albert showed us). They've had some corrosion problems with the original brake system with their older amphib floats and replaced steel springs for the water rudders with rubber bungees, but other than that they've been operating these airplanes in Guadeloupe for many years. Orizon ULM has been in operation since 1992 (the same year Zenith Aircraft Company started operations in the US) and is run by Albert and Danièle. They provide great hospitality in a professional yet very relaxing Caribbean environment. Albert Ukena is a sought-after seaplane flight instructor, teaching ultralight flying throughout the Caribbean (and he instructed in France prior to moving to Guadeloupe). As Zenair dealers, Orizon-ULM has built a half-dozen STOL CH 701 from kits, with Danièle overseeing their construction. A new third partner and flight instructor, Pierre Duval, who is fluent in English, was away sailing during our visit. Orizon operates float planes (hydro avion in French) exclusively. Where Orizon is located there is no (solid ground) runway nearby as they are surrounded by water (wide open fields for a seaplane). They use the wheels of the amphibious floats to taxi in and out of the water using the ramp and to visit the six surrounding airports in Guadeloupe. 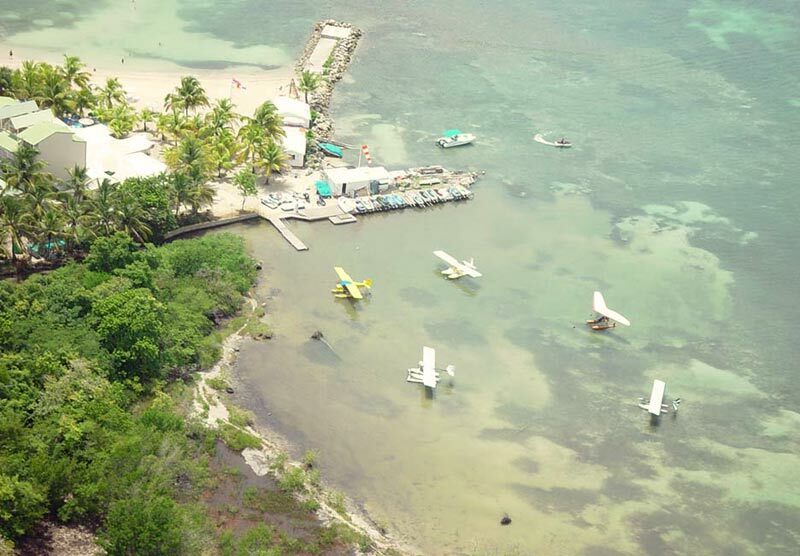 The seaplane base is just a few miles from Guadeloupe's International Airport at Pointe-à-Pitre (PTP) right next to a row of resort hotels, making it very accessible. Click here for an aerial view. Here we go flying, with the wheels nicely retracted. Take a look at the video clips for a much better feel of the flight. As a ULM / microlight, Orizon uses the STOL CH 701 for flight training, scenic flights and banner towing. They would love to get their hands on our new STOL CH 750 but it is currently too heavy for the French ULM rules (we're working on that!). My wife Susan went flying with Albert and just loved the flight (her first ride is a seaplane). Click here to view a video of her flight. Those of you familiar with the STOL CH 701 will have noticed a few differences on Orizon's trainer (though I suppose every homebuilt is one-of-a-kind). The main difference is the wing on this STOL CH 701. Albert was given a pair of "PegaSTOL" wings with retractable leading edge slats so he tried them out (the PegaSTOL wings were marketed a number of years ago to STOL CH 701 customers). After our float flying adventures we drove across the island (about 25 miles) to the small town of Saint-François on the eastern tip of Grande-Terre, Guadeloupe to visit the other flying school: ULM Caraibes. Here I chat with the Jean-Claude Antoine, the owner and chief flight instructor, who teaches flying in the Zodiac. Their Zodiac XL trainer has logged more than 2,000 hours over the years as a rental plane and trainer, and students and renters use the aircraft regularly to visit surrounding islands: There are six airports to visit around Guadeloupe. These small airports are well maintained with good paved runways. The runways are short and challenging (excepting the international airports) but they're barely at sea level so are easy with Zeniths. General aviation (GA) pilots require a specific sign-off / endorsement to fly in or out of some of the more challenging airports. My favorite is on the island of La Désirade, which is located just 12 miles from Saint-François (just across the ocean!). The 2,000-ft. runway is surrounded on three sides by sandy beaches on the ocean! Click here to view a video clip of a landing on La Désirade. Above, Matt chats with Jean-Claude. There are three solid red low-wing Zodiacs based at Saint-François (TFFC) as well as several STOL CH 701s. The Zodiacs used to be bright red when new but the constant southern sun has faded the paint somewhat over the years. Getting to and from Guadeloupe from the US or Canada is not very quick or easy... The trip there was supposed to take all day (with two layovers) but we ended up missing a connecting flight and spending an unplanned day visiting old San Juan in Puerto Rico (which turned out be fun). From Europe there are several direct daily flights. On our way home we missed the early gate check-in by a minute on the one daily flight out (on AA) so we had to spend an extra day visiting and relaxing (above, at Pointe des Châteaux). I think the ultimate way to get there is to fly a STOL on floats from Florida and island-hop all the way to Guadeloupe... maybe that's for next time! On our way out of Pointe-à-Pitre , we saw another couple of 701s on the ramp at the international airport. In total there are over a dozen Zeniths on this small island, and some more on Martinique and St. Barts. For those of you who would like to spend some relaxing time in the Caribbean on a unique island, while also spending some high-quality time flying the STOL CH 701 amphibian or the low wing Zodiac on wheels (visiting interesting airports), I highly recommend you visit, especially if you're a little bit adventuresome (and are tired of the all-inclusive cruises or resorts on the more developed Caribbean tourist destinations). I'm already looking forward to my return visit. Let me know what you think (comment below) or email me directly if you have any questions. So, Sebastien, what happened to the photos of the 'clothing optional' beaches you buzzed? FANTASTIC! Especially since we now have for the first time in over 40 years, gained approval to operate float planes in Ghana. Very inspiring! Thank you! Herzliche Gratulation zu diesem tollen Bericht. Motiviert für Ferien in Guadeloupe! !